From baskets to egg hunts, plastic Easter eggs toys make a fun surprise for a variety of Easter activities. These inexpensive, versatile plastic eggs come in many different varieties and color patterns. Whether you want to use them to replace boiled eggs or in additional to traditional dyed eggs, you can find these eggs in nearly any retail establishment during the Easter holiday season. Plastic eggs abound from a variety of retailers. You'll find dozens of different styles of plastic Easter eggs, including a unique white plastic egg with a black mustache design. The bright eggs come in a pack of six dozen eggs. Each are brilliantly colored and have a design of stripes, flowers, swirls or polka dots. They also offer plastic eggs that look like basketballs, with Bible sayings, that look like baseballs, footballs or are solid colored. Want to use plastic Easter eggs, but worried about adding to the landfills once Easter is over? Eco-eggs are are made from self-sustaining plants and will deteriorate in a landfill. They are large eggs that measure 3 by 2.25 inches, so there is room for small bagged candies and toys. They come in basic spring pastels and cost a little more than the eggs you'll find at Walmart or Target, but they also will help you reduce your carbon footprint. If you're planning a large hunt or party, you'll save time with American Carnival Mart's pre-filled eggs. You do have to buy the eggs in big batches of 5000 pieces (2500 eggs), but they come pre-stuffed with your choice of candy, stickers, toys, large candy or a combination of candy and toys.The company also sells stuffers individually as well as unfilled plastic eggs. In addition to traditional pastels, they have a translucent plastic egg and a glow in the dark egg. There are occasions when you might want to use a plastic Easter egg, but it isn't actually Easter. Party City offers an interesting collection of plastic eggs that can work for birthday parties and other events. You'll find character themed plastic eggs for Dora the Explorer, Mickey Mouse, Thomas and Sponge Bob. If you want a more traditional Easter egg look, but a unique pattern, try the animal print Easter eggs, which come in fun colors but have leopard, zebra and giraffe prints. Sunny Bunny Easter Eggs will fill your prefilled Easter egg needs, but in the process they employ 250 people with disabilities. They offer prefilled eggs in three pastel colors. They come with an assortment of stickers, toys and candy and can be bought in lots of 500 or 1000 eggs. The company also offers a gold-colored plastic egg. One way the golden eggs can be used is to hide special prizes. Plastic Easter eggs have long been a staple for Easter. Baskets filled with the inexpensive and brightly colored eggs make a sunny bit of home décor for the holiday. 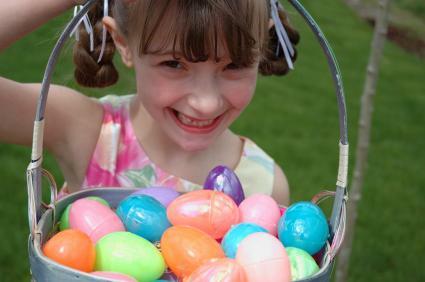 Plastic eggs are perfect for egg hunts and other fun activities for kids and can be purchased in bulk. They are also a mainstay for children's Easter baskets, hiding small surprises certain to bring smiles to little faces. Although candy (such as jellybeans, chocolate, small marshmallow bunnies and other small treats) are often placed inside plastic eggs, small toys are another alternative to place inside the eggs as a surprise. Since eggs come in several sizes, from standard to mini to extra large, there are a variety of fun trinkets and playthings that can be placed inside. Toys can be Easter themed or just colorful small toys. In addition, items like pencil toppers, erasers, stickers, and backpack pulls make great surprises inside Easter eggs. Novelty jewelry, such as plastic rings and charm bracelets, make great toys for girls. Maybe traditional plastic eggs aren't quite what you're looking for. Some toys are a combination of a plastic egg and a toy. Hearth Song offers wind-up hopping eggs in sets of eight. This toy is recommended for children over three years of age. They are four inches tall and have a manual wind on the side of the egg. When wound, the plastic feet on the eggs march and hop. Dancing Eggs is a game that the whole family can get involved in. The plastic yellow eggs come in what looks like a real egg carton. Players roll the dice. Once an egg is released from the carton and placed on the table, it will begin to dance and move. Players must compete to catch the egg and keep the egg by holding it in the position the dice says, which can be the armpit, between the knees, under the chin and other crazy positions. Plastic eggs are a perfect toy for Easter, but are also useful to pass out small treats at a birthday party, have scavenger hunts with large groups of kids or to play a fun family game. They can be used to decorate a tree in your yard, make crafts or just to decorate your home. With so many different designs and types of plastic eggs, the possibilities are limitless.